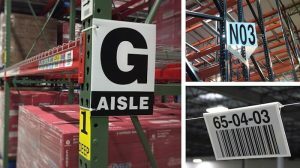 A Buyer's Guide to Warehouse Signs | ID Label Inc. Enter a typical warehouse or distribution center today and you might be reminded of that classic rock lyric. That’s because proper signage is an essential part of productive warehouse operations. As one of the industry’s leading providers of warehouse signs, we put together this short post to help you understand some of your warehouse sign options. Warehouse signs play a critical role in helping forklift operators and other employees find precise inventory locations quickly and efficiently. 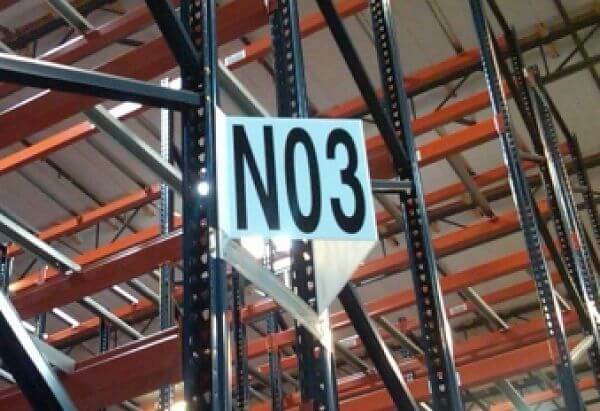 Warehouse signs help to identify aisles, racks, bulk storage areas, dock doors, safety equipment and more. They can be manufactured using a wide variety of materials and designs, including PVC and aluminum. It might seem obvious, but warehouse signs play a critical role in helping forklift operators and other employees find precise inventory locations quickly and efficiently. This is especially critical for 3PL and other facilities that frequently reorganize a building’s layout and relocate stock due to seasonal or other demands. Beyond productivity benefits, clear identification in a facility aids navigation, accuracy, safety, inventory management and shipping operations. ID Label’s popular two-sided “Z” sign allows for easy long-range scanning from either side. Signs help to identify aisles, racks, bulk storage areas, dock doors, safety equipment and more. They can be manufactured using a wide variety of materials and designs. Aisle signs – Typically located at the end of aisles, these human-readable signs identify rack location areas to support efficient stocking and picking of inventory. Aisle signs come in a wide variety, including flat, cube and teepee designs. They can be manufactured using an array of material, from industrial-grade Coroplast or PVC to heavier-duty options like aluminum. Bulk location signs – These signs are used to identify bulk storage areas, typically via an overhead hanging sign that contains a barcode image and human-readable numbers or letters. For operations that can accommodate long-range scanning, retro-reflective graphics are used for optimum scan accuracy. Overhead sign installation can easily accommodate a building’s infrastructure. Some might hang from conduit or metal cabling while others might be mounted to existing joists or fixtures. For areas where hanging signs aren’t an option, floor plates with ID Label’s BullsEyeTM durable barcode labels are also a good solution to mark bulk locations. Staging signs – It’s also common to label staging areas with proper signage. This helps facilitate the efficient movement of items that have been transferred from pick or packaging areas to the staging location where they are ready to be loaded for outbound shipment. Inbound inventory may also be staged as it is removed from trucks as part of the put-away process. Installation options are similar to those for bulk locations. 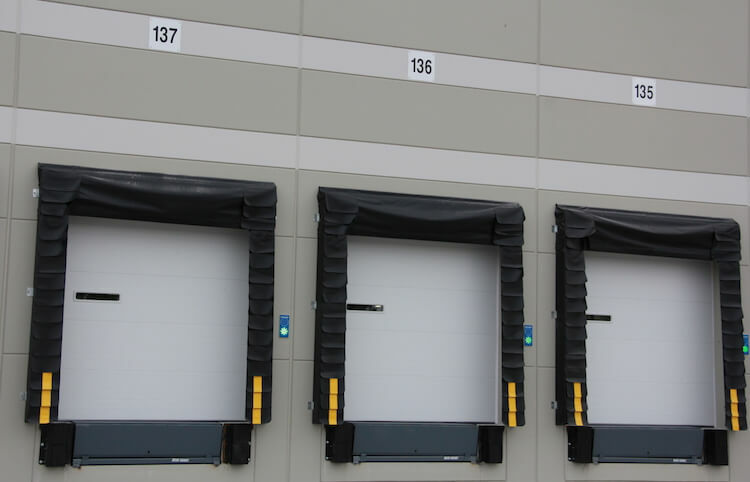 Dock door signs – Loading docks should be clearly labeled with large signs – both inside and out – to support the efficient movement of inbound deliveries and outbound shipments. Be sure that your outdoor signs are manufactured with durable materials and graphics that are able to withstand wind, rain and ultraviolet rays from the sun, which can cause fading and deterioration. Anodized aluminum material with UV-resistant graphics is typically a good solution to stand up to Mother Nature for several years. Safety signs – There are dozens of uses for safety signs in a typical warehouse or distribution center. They might alert workers to danger, note or direct forklift truck traffic, advise caution when near battery charging stations, highlight access to safety equipment such as fire extinguishers or eye-wash areas, or remind employees of ways to avoid injuries. Durable dock door number signs manufactured with anodized aluminum and UV-resistant graphics will stand up to Mother Nature for several years. 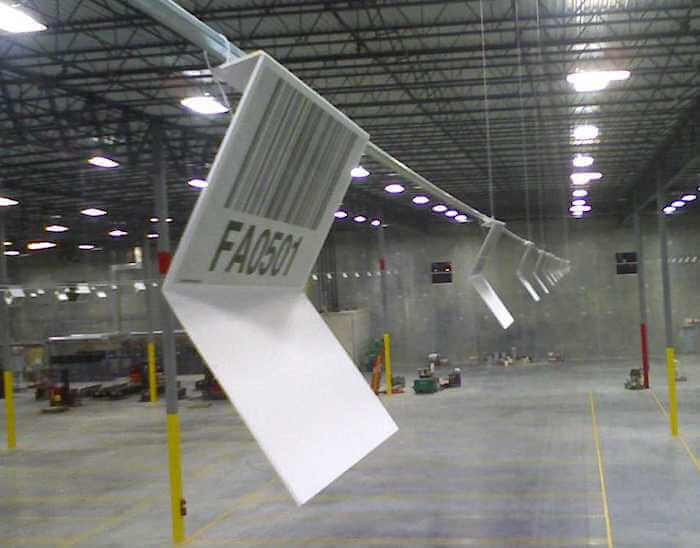 Warehouse signs should be manufactured to be durable and reliable, especially those that contain barcode images. After all, you’re relying on them to scan accurately every time — even from long-range distances – and to help keep your operations running efficiently and productively. Not Sure What’s Right for You? We Can Help! ID Label produces thousands of signs annually for leading warehouse and DC operators, using a huge variety of designs, colors, fonts and materials. All signs are custom-manufactured to our clients’ precise requirements. Not sure which designs or materials are right for you? Let us recommend a complete solution that meets your needs and budget. We’ll even install them for you!